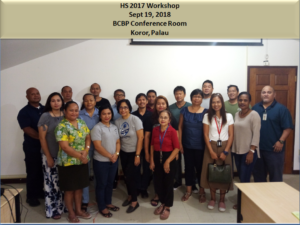 Over the course of 1 week, the Bureau of Customs & Border Protection (BCBP) hosted the Harmonized System 2017 and Classification of Goods Workshop organized from 17 to 21 September 2018 at the Customs main office conference room in Malakal. Earlier in the month, Customs also conducted similar training for staff and management. The national workshop was extremely beneficial to the public and private sector which included a total of 120 participants over the course of the week. The opening of the workshop was officiated by John Tarkong Jr., Director, BCBP, who emphasized the willingness of Palau Customs and our stakeholders to jointly work together in order to ensure the correct tariff classification of goods and uniform application of the Harmonized System was being implemented in Palau. 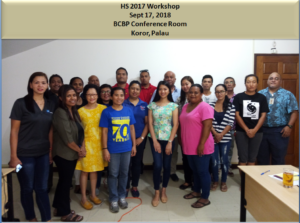 He encouraged the participants to take advantage of this high level workshop and interact with the presenters from Palau Customs. He pointed out the importance of the Harmonized System (HS) for Trade Facilitation as Palau is in the process of moving away from the HS 2012 HS Tariff Coding System to the HS 2017 version. The objective of the workshop was to assist our stakeholders in the uniformity and application of the HS 2017 and any changes and updates on the HS related tariff classifications. There were a wide range of HS-related matters that were addressed by the participants. Special attention was paid to issues relating to the processing of their entry declarations, valuation, rules of origin and other day to day challenges that included properly classifying goods without misclassifications and other errors that may sometimes cause delays in receiving their goods. While Palau does not have any legislation governing the framework and use of the Harmonized Tariff Coding System it is our intention to provide and introduce such legislation. Regardless, Palau is renowned for probably being the only country that has implemented the use of HS Coding System by all importers and exporters and what’s surprising is that Palau is not even members of the World Trade Organization (WTO) and the World Customs Organization (WCO). The HS Tariff Coding system is of great importance as it is used by international organizations and national governments to accurately account for all trade and statistical related data for imports and exports. The workshop was very important because it helped educate our stakeholders in implementing the correct identification of the products being imported / exported and address some specific HS-related aspects under the HS 2017. Tarkong mentioned that the HS 2017 version will be implemented on October 01, 2018 so this workshop was important for all of us. Overall, the participants reiterated their commitment to implement the HS 2017. On behalf of Customs, we would like to thank all the participants for attending the workshop and the facilitators for taking the time to organize and conduct the workshop.